Joss Whedon gets vaunted a lot for being a Feminist creator (though he made a silly speech about not liking the word Feminist) so it is especially annoying when he blunders, intentionally or not. 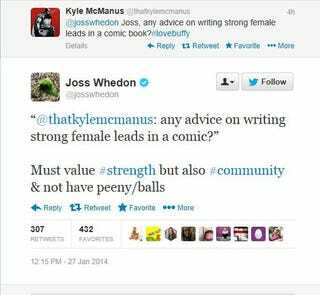 Whedon's joke is cissexist in being based on the joke that "of course women have vaginas duh" which is transmisogynistic since there are many women who do not. His "joke" insults trans women and intentionally or not promotes misgendering us which leads to discrimination and high levels of violence. Is Joss Whedon a transphobe? Maybe not more then many other cis people but he is promoting transphobia intentionally or not. He likes to include gay, lesbian, and bisexual characters in his fiction, it is time he cared about the T in GLBT as well. He should apologize for the tweet.